But not all animated shows have embraced such surreality. King of the Hill — Mike Judge’s quiet, under-appreciated study of the modern American family with a Texas twang — remained grounded throughout its run. Bob’s Burgers is another animated series, which has kept its feet mostly on the ground while proving to be both pleasantly weird and surprisingly sweet. Created by Loren Bouchard, the series exists in a similar small-stakes domestic domain as his previous projects like Dr. Katz and Home Movies. Set in a fictional seaside town (possibly on the Jersey shore), the Fox series, which just started its fifth season, follows the adventures of the Belcher family and a host of supporting characters voiced by some of the best comedians and voice actors working today. Bob might look like the schlubby hubby archetype, but he’s neither a bumbling oaf like Homer Simpson nor a shitead misogynist like Peter Griffin. He’s the straight man to a gang of screwballs, who is often vexed by his family’s antics. But that frustration never grows beyond mild aggravation. Bob indulges their flights of fancy with passive bemusement. His quiet chuckle in response to his family’s wild ideas never fails to make me smile. It’s a subtle touch, but in these fleeting moments the series’ warmth comes through. As a couple, Bob and Linda are one of TV’s best pairings. They treat each other as equals, working side by side at the restaurant and as parents. It’s a complementary relationship; Bob is pragmatic, Linda a free spirit. Together they find a balance that reflects the show’s ability to have fun without devolving into narrative chaos. As parents, Bob and Linda are flawed but earnest. They make mistakes, but their hearts are always in the right place. And despite their lower-middle class status, they always work hard to put their children first. This love is even more evident in the way Bob and Linda allow the kids to be themselves. 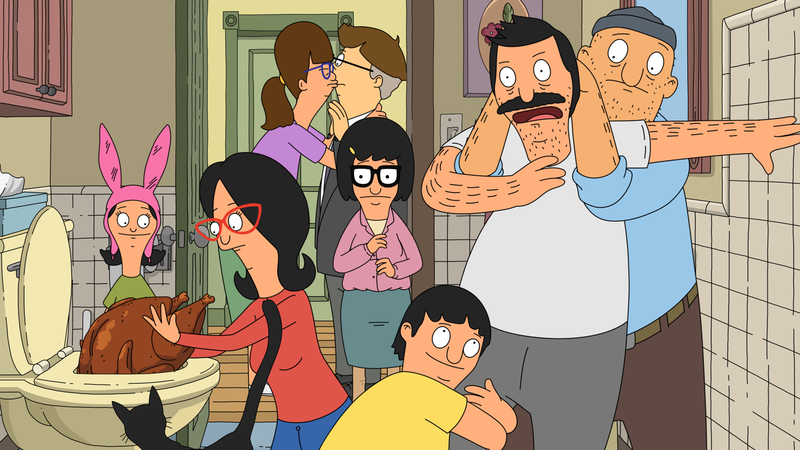 In the Belcher children, Bob’s awkwardness and Linda’s free spirit is manifest. These kids are far from cool, but they are immensely likeable. Like the parents, the show has a firm grasp of who these characters are, and what makes them tick. Eldest Tina (Dan Mintz) is an adolescent equally obsessed with boys’ butts and zombies. In the real world, Tina has taken on a life of her own as the awkward spirit animal to teens everywhere. Ten-year-old Gene (Eugene Mirman) is a pudgy creative type whose passion for his Casio keyboard is matched only by his love of farts. Socially, he owns his outsider status with enthusiasm and confidence. Gene is weird, and that’s wonderful. Louise (Kristen Schaal), the youngest, is a Machiavellian sociopath in training always working a new scheme. Louise is a lot of fun, and though her machinations may seem grandiose, the show always tempers her actions by reminding us that she’s still a kid — Louise may be clever enough to stash a bug-out bag in the park, but the burner phone she keeps in it is filled in with candy. The supporting cast of restaurant regulars and schoolmates is easily the deepest bench of top voice talent this side of BoJack Horseman. Jenny Slate, Bill Hader, Aziz Ansari, Sarah Silverman, and Andy Kindler all have recurring roles. All this is to say Bob’s Burgers is one of the best half hours currently on television. It manages to be smart and funny while still having a heart that never gives way to cheap sentimentality. While other sitcom families may have sharper edges and play for bigger laughs (and ratings), few are as consistently entertaining and pleasant to be around as the Belchers. Bob’s Burgers airs Sundays at 7:30 p.m. on Fox. Previous seasons are streaming now on Netflix. ← Identity crisis: Can ‘Gotham’ fly without Batman?